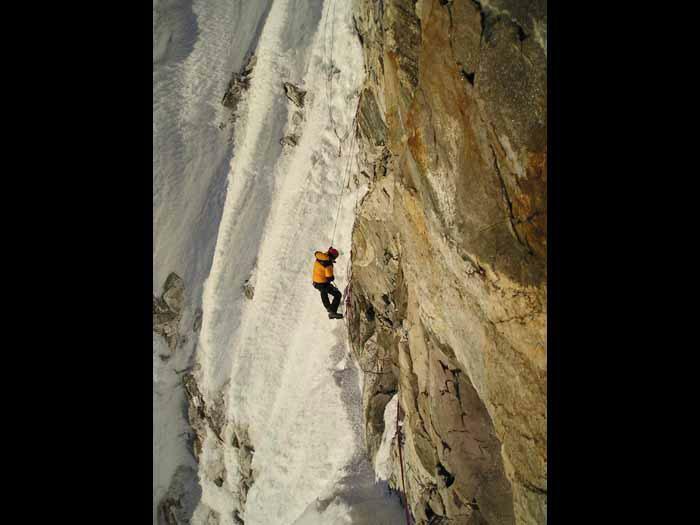 Asia's most famous rock, snow, and ice climb. 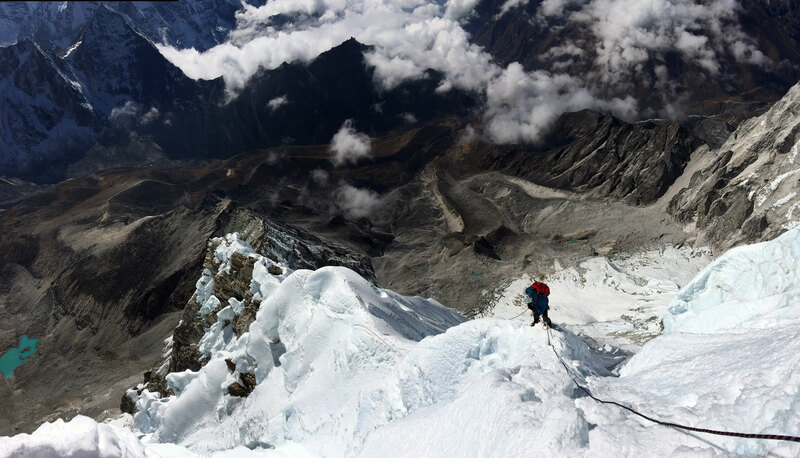 The Matterhorn of the Himalaya is technical, but climbable. 10 October to 7 November or 1 November to 29 November (29 days in Nepal). Flexible, custom dates are also available. Call or email for details. 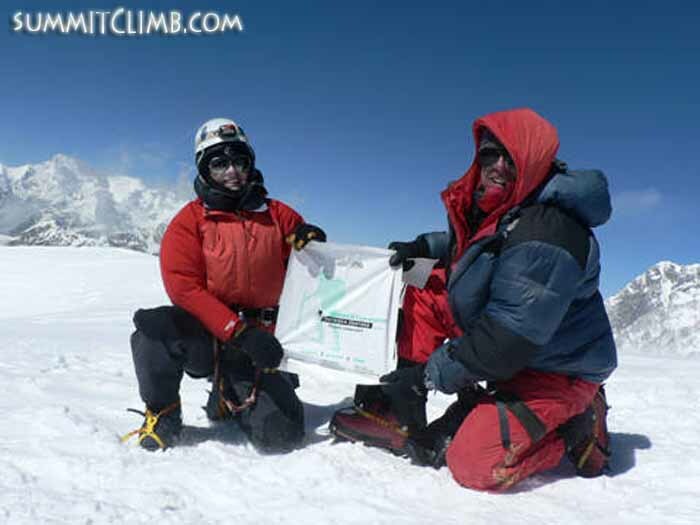 Leaders: Dan Mazur and Martin Szwed, 9 Successful AmaDamblam expeditions, friendly, good teachers, technically accomplished. 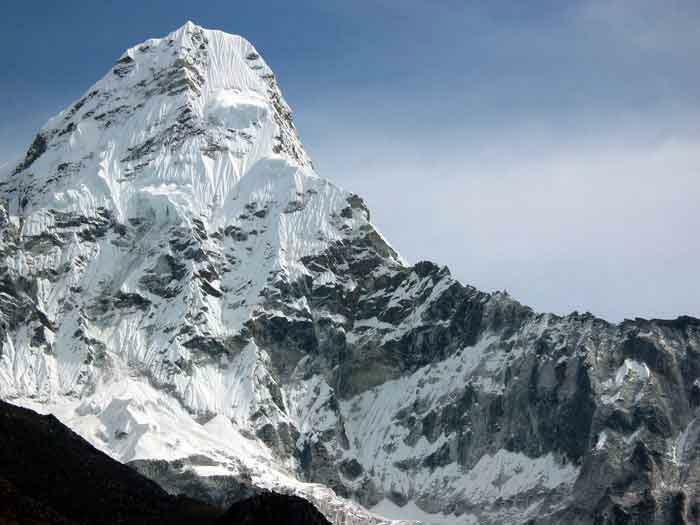 AmaDablam, 6,812 metres (22,349 feet), is perhaps the most visually striking mountain in the world. 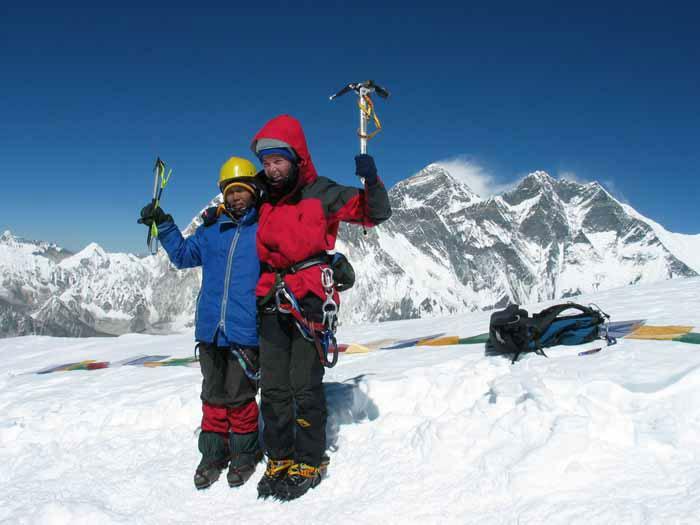 This expedition offers member the opportunity to climb snow, ice, and rock surrounded by stunning Himalayan views. 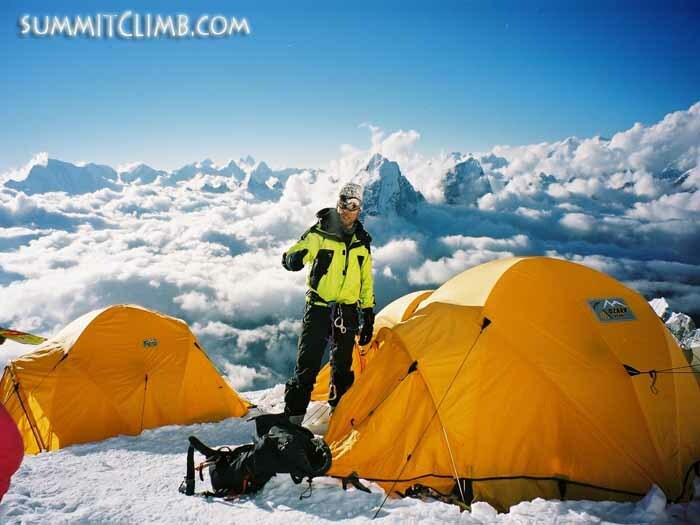 The upper camps on AmaDablam are world renown for their exposure. 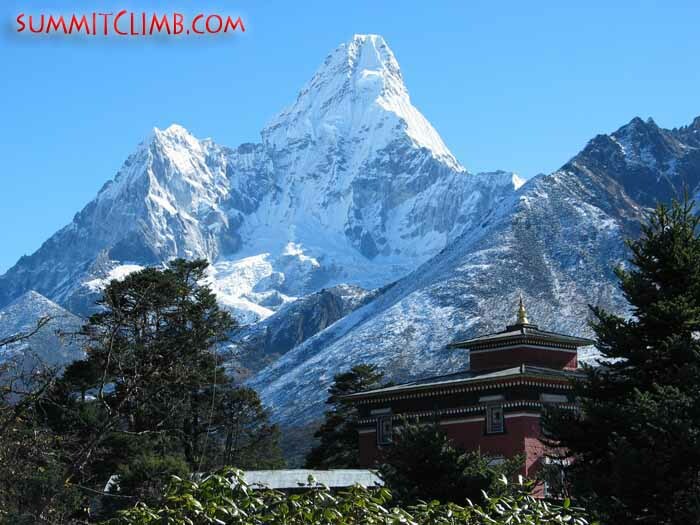 AmaDablam is coveted expedition for novices and expert climbers alike. 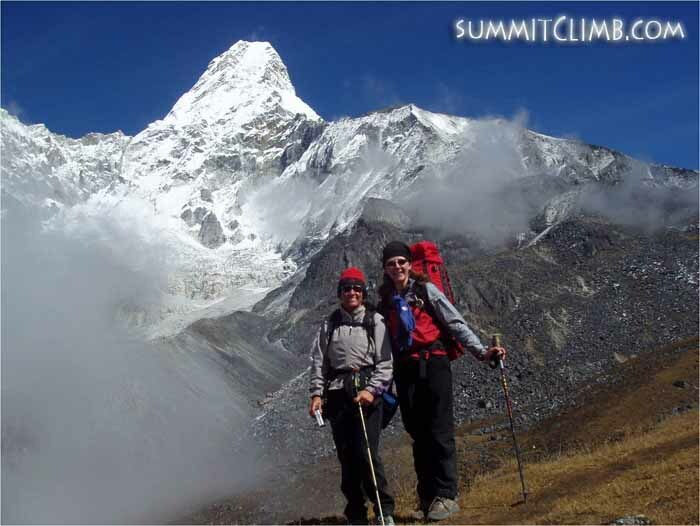 1) Arrive Kathmandu, Nepal, 1,300 metres (4,265 feet). Stay at hotel. 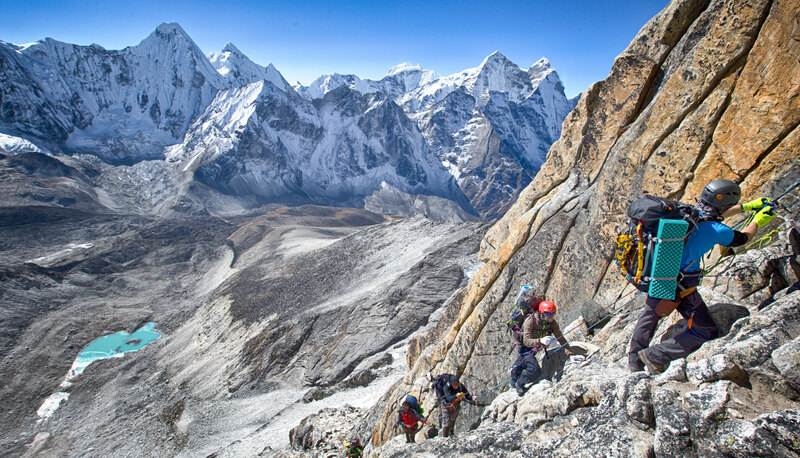 2) Explore Kathmandu, finalize arrangements. 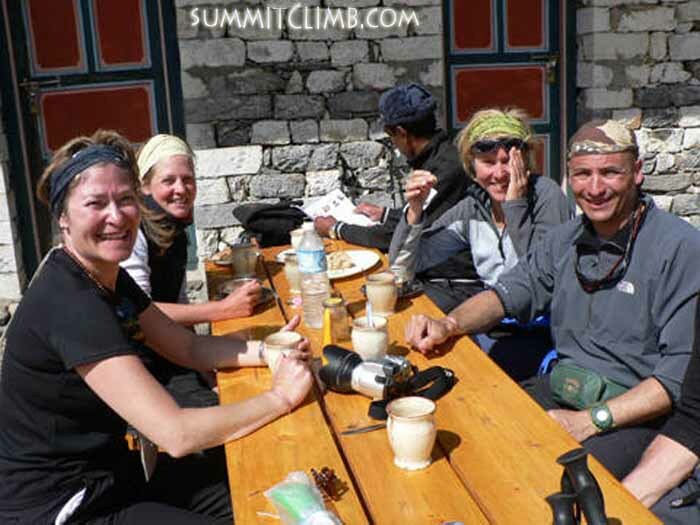 5) Rest & Acclimatization in Namche. Sleep in tea house or camp. 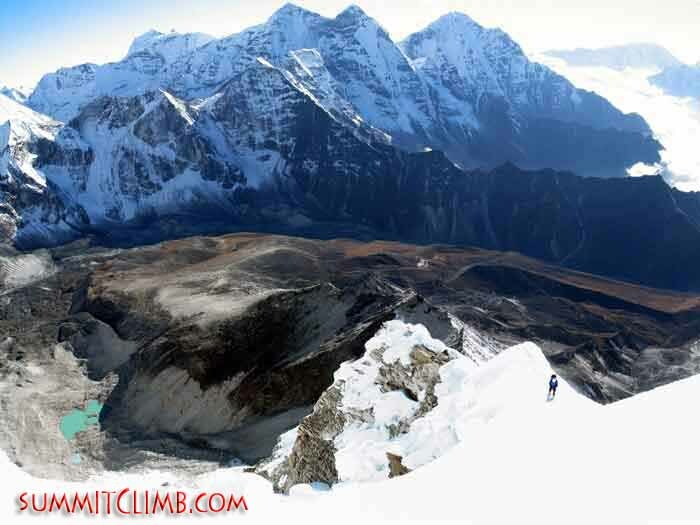 6) Walk to Pangboche 3,860 metres (12,644 feet). Sleep in tea house or camp. 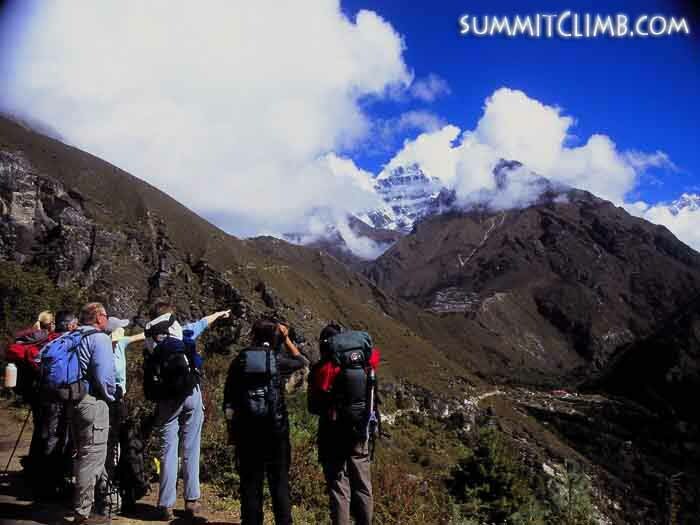 7) Walk to Base Camp 4,650 metres (15,256 feet). 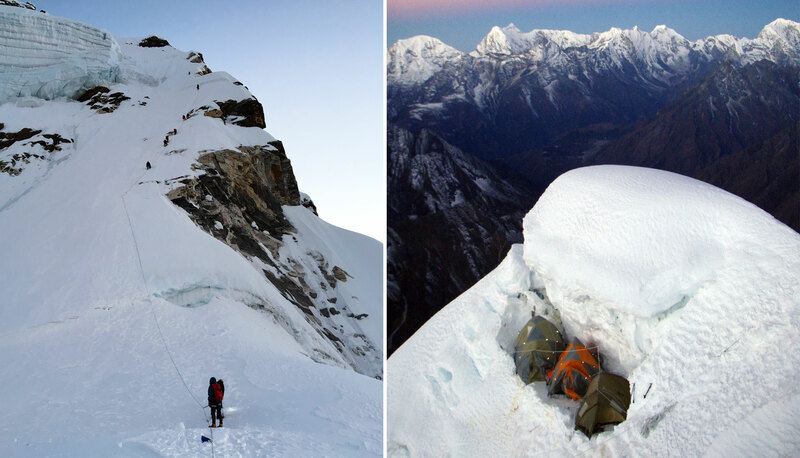 8) Rest, acclimatization, and training in basecamp. 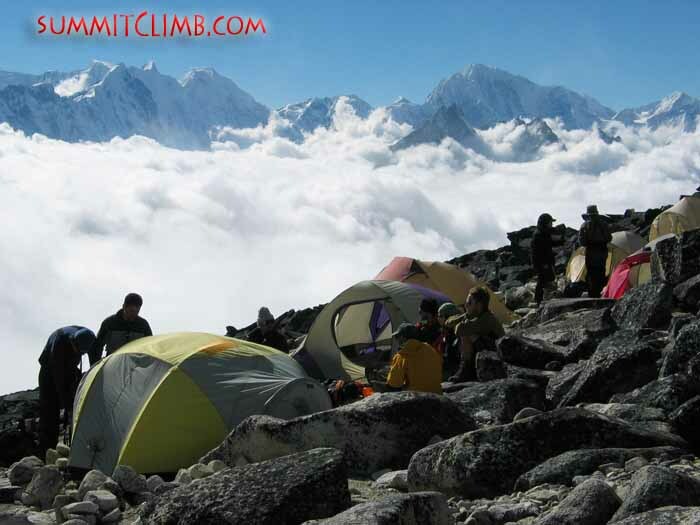 9) Walk to advanced basecamp, 5,350 metres (17,552 feet), Sleep in basecamp. 10) Walk to advanced basecamp. Sleep there. 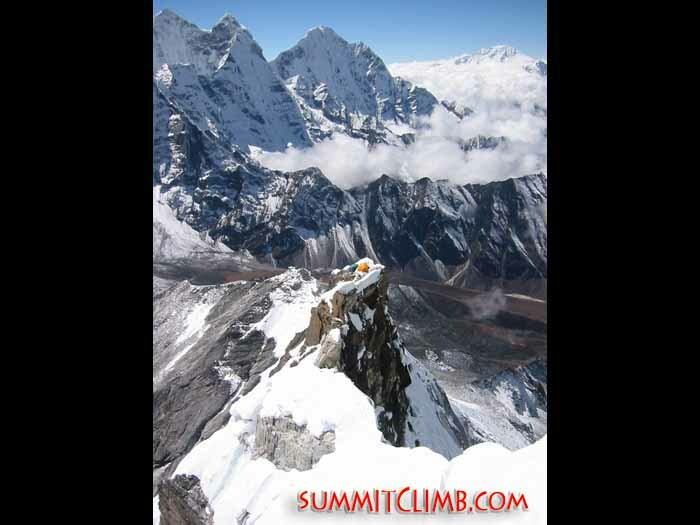 11) Hike to camp 1, 5,700 metres (18,701 feet). Return to basecamp. 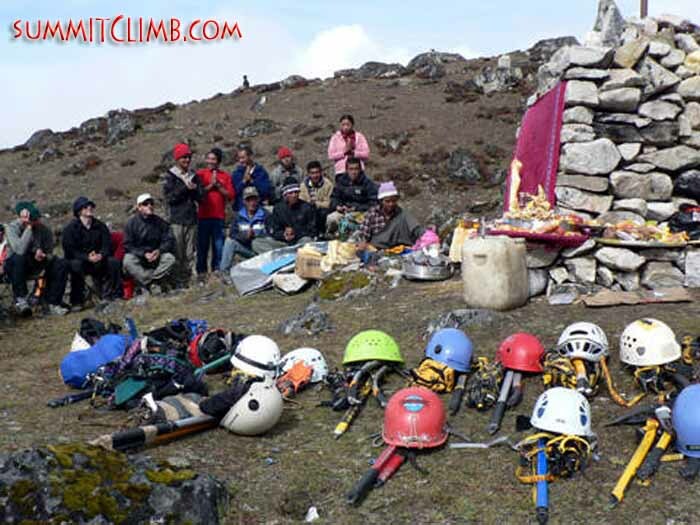 12) Rest and acclimatization in basecamp. 13) Walk to advanced basecamp. Sleep there. 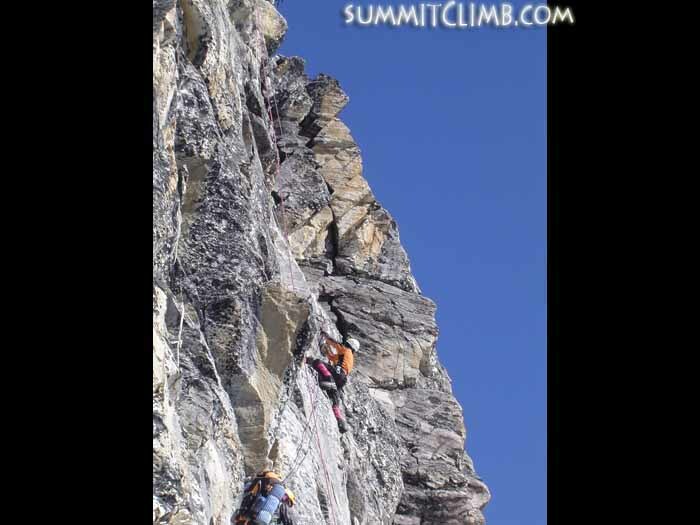 14) Scramble to Camp 1. Sleep there. 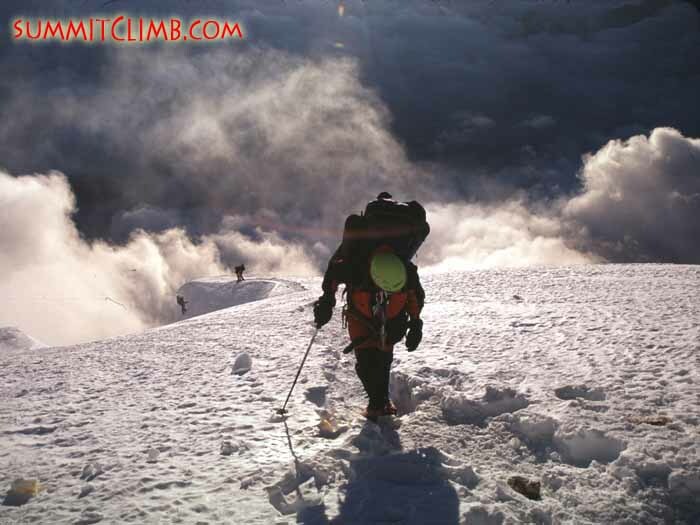 15) Climb to camp 2, 5,900metres (19,357 feet). Return to basecamp. 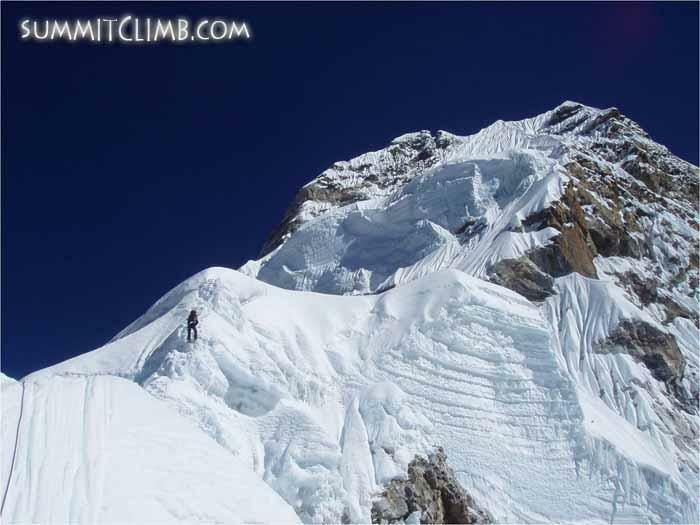 17) Walk to advanced basecamp, scramble to Camp 1. Sleep at camp 1. 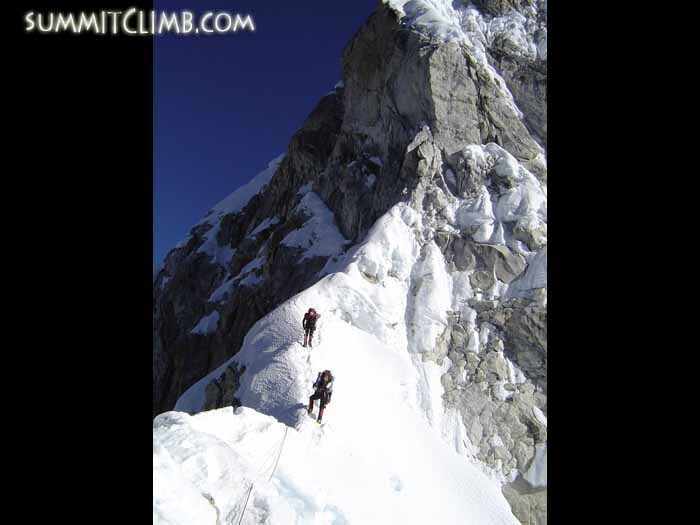 18) Climb to Camp 2. Seep in camp 2. 20) Relax in advanced basecamp. Sleep there. 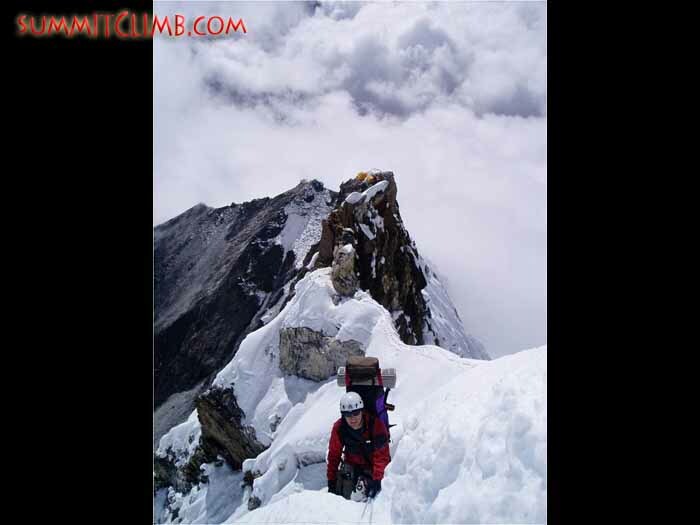 21) Climb to camp 2. Sleep there. 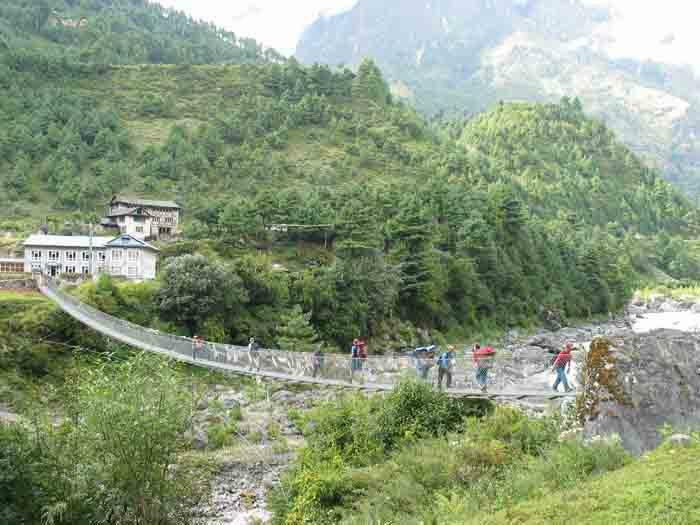 24) Return to ABC, pack up basecamp, walk down toPangboche, Sleep in tea house or camp. 25) Walk down to Namche. Sleep in tea house or camp. 26) Walk down from Namche to Lukla. 27) Return flight to Kathmandu. Stay in hotel. 28) Extra day of rest and celebration in Kathmandu. Do take a taxi out to Bhaktapur if you wish to visit an impressive temple city. Stay in hotel. 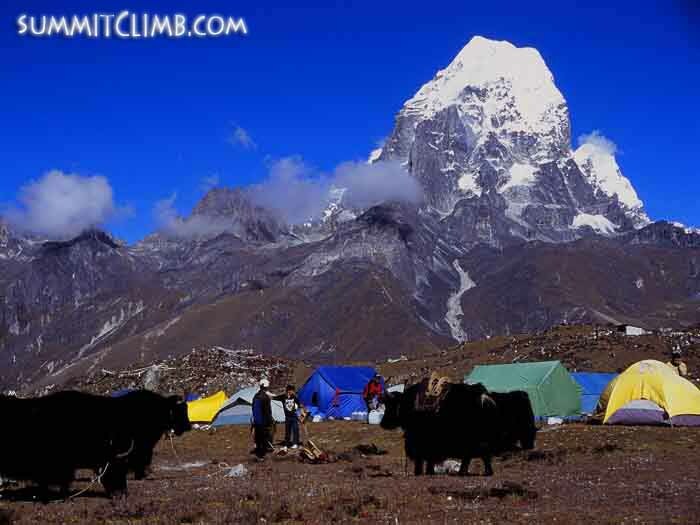 AmaDablam Camp 2 seen from Camp 3. 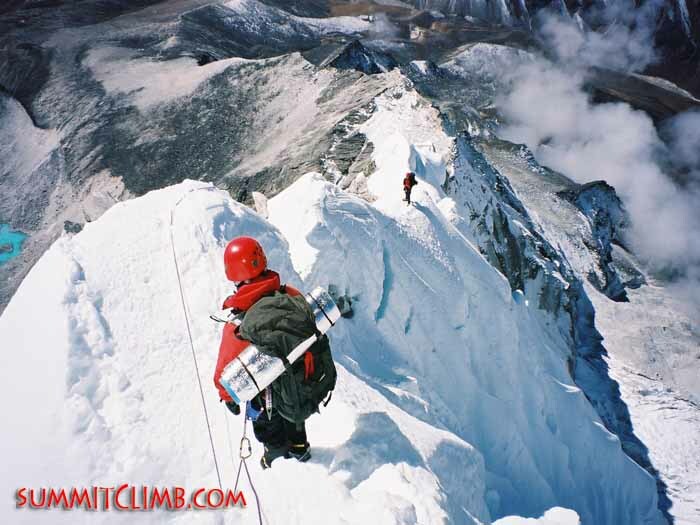 Photo Martin S.
Just about to reach Dablam. Photo Fabian. Camp 2. "I personally felt the trip was very well organized and executed. I was very impressed that you cared enough about the anchors and ropes to fix them properly. 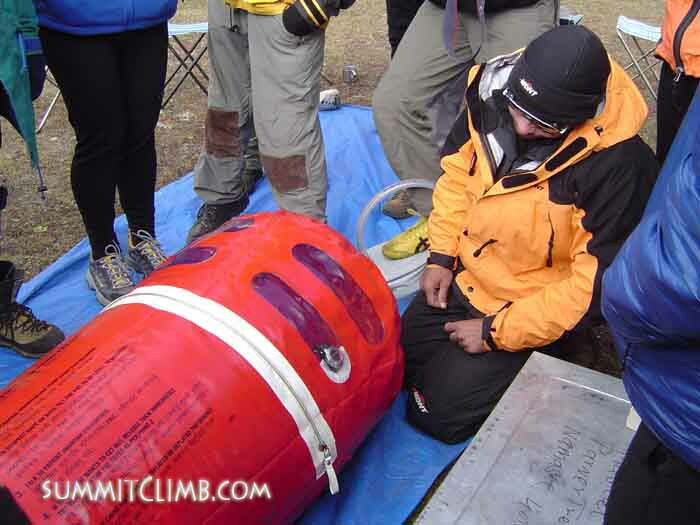 Most other expeditions seemed to not care and were willing to use whatever was currently in place." "Regarding the expedition I have only praise for you!! The new web site is very good and feedback from family and friends says that they were able to follow the expedition very closely!! BZ! I have no hesitations in recommending this trip to anyone. All in all I am very satisfied with the trip!!" "What I liked best about this expedition was the focus of independence that was placed on each person. I have been on other "guided" climbs and I never felt like I was gaining much in the ability to become a self-sufficient climber. On this trip, I felt good about the knowledge and confidence that was gained, knowing that I had to take care of myself as well as look out for those on my team. I especially liked they way everyone climbed at the rate that best suited their own fitness level. I never once had the feeling that I was waiting for someone to catch-up or that I was holding up the team. There are a couple of things that I feel individuals can do to make this trip an enjoyable experience. 1. Train! I have always found that the more fit I am, the more I enjoy any expedition. Also, research the route and come prepared with the knowledge of what to expect. 2. Come with a relaxed, open mind. 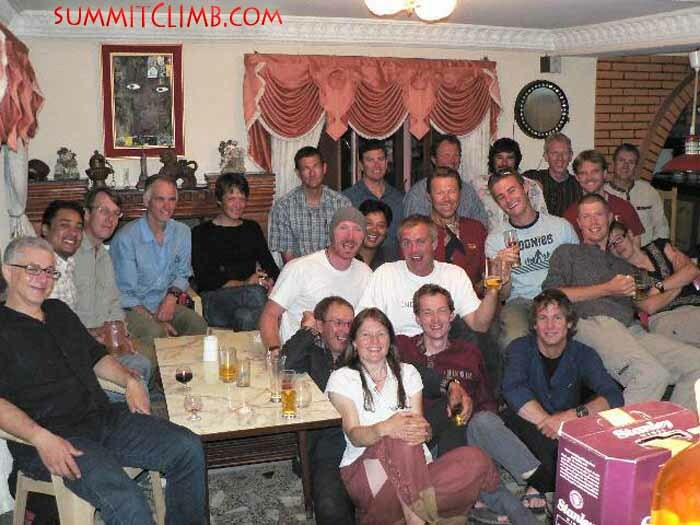 The team dynamics on my Ama Dablam trip were great because there were no stringent agendas (personal, or otherwise) I have found that it is the less uptight people that generally have the best experience and now that I think of it, the reason the Ama Dablam trip was free of this aspect was probably because of the personalities of the leaders. They are serious about why they are there, yet it is approached with a "no worries" attitude. I LOVED THAT! And it obviously worked, because every member of our team summitted. Because we had many Sherpa on our team and we interacted a lot during the climb, I felt this was a cultural experience as well. Many spoke a little English so we were able to converse, ask questions about their lifestyle and customs. 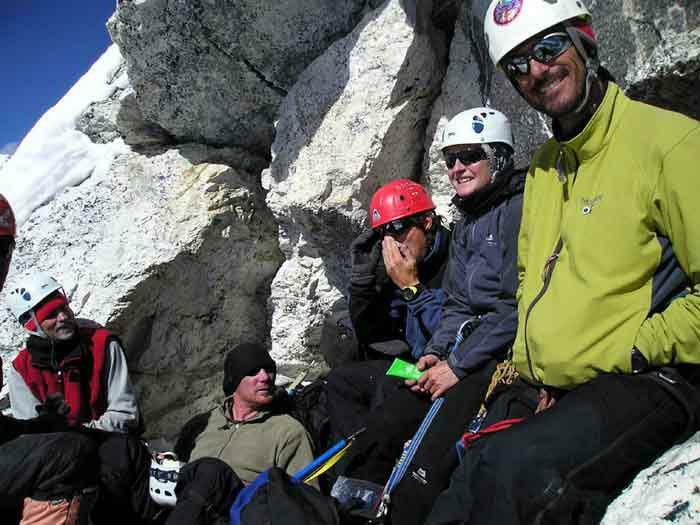 They were an integral part of our expedition, hard working and very experienced. I was glad to have had this interaction as it gave that much more feeling to an “international” endeavor. My concern about any problems in Nepal I heard about before the trip were non-existent in the areas we traveled. We did not witness any such disturbance. Traveling as a single female, I am probably a little more cautious than most but I have to say that never once did I feel concerned about my safety. Looking back, if there was one thing that I would suggest to make this trip better it would be more yak cheese pizza at basecamp! Yum, this stuff was delicious. 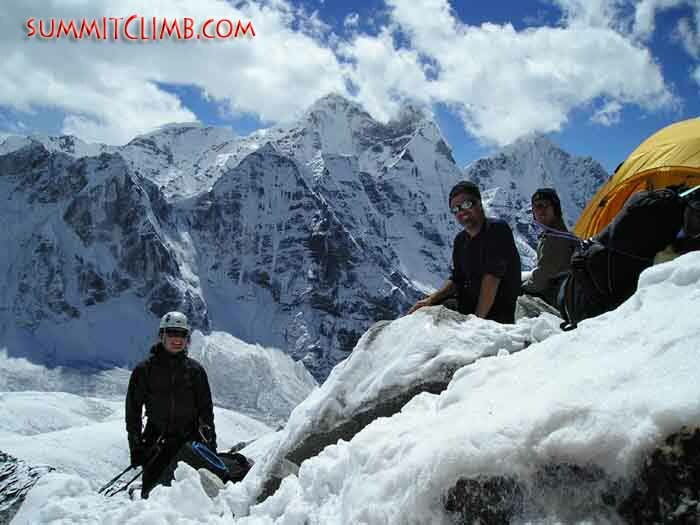 Overall, this company gets top marks for their operation and that is why I will definitely climb with them again in the future." Thank you for a fantastic trip! I'm safely back home, already back at work! Regarding your expedition, all I have is praise! Things very generally well organized, however provided enough slack to allow a lot of personal preferences. Everyone in the staff were good people, the climbing sherpa's were strong and the kitchen staff made great food and took good care of us. Impressive staff, and I would like to mention the climbing sidar, Kagi, as a person who made lasting good impressions. I also felt that the schedule of the trip regarding the trek in, acclimatization and duration was good, and well thought out. 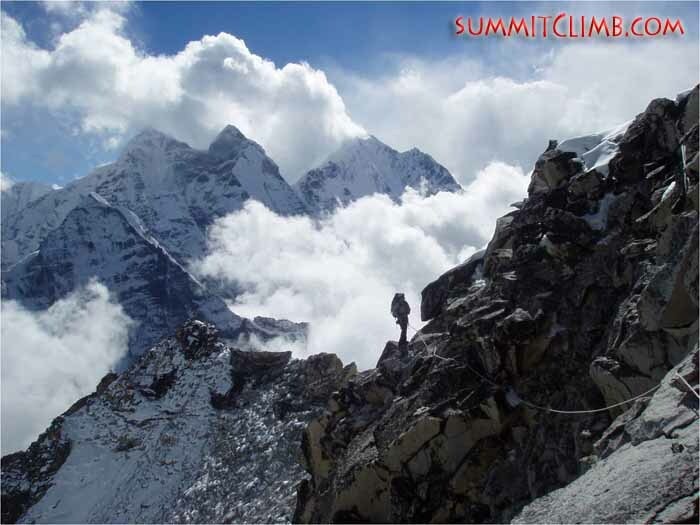 Thank you for a great adventure, a spectacular summit, nice people and staff and fantastic weather." "First and foremost I have to thank you for warming my toes in camp 3 and suggesting swapping my layers around - I'm sure I couldn't have gone a step further if you hadn't helped with the defrosting exercise!! I really enjoyed the trip and the whole group were great fun to be with. Considering how large the group was, and a number of concerns about this were raised amongst the group, the ascent groups were pretty well organised. The meals were pretty darned good considering logistics, supplies and camp locations. The lighting was excellent in the mess tent. The cooks were great and so polite and hard-working in all camps. 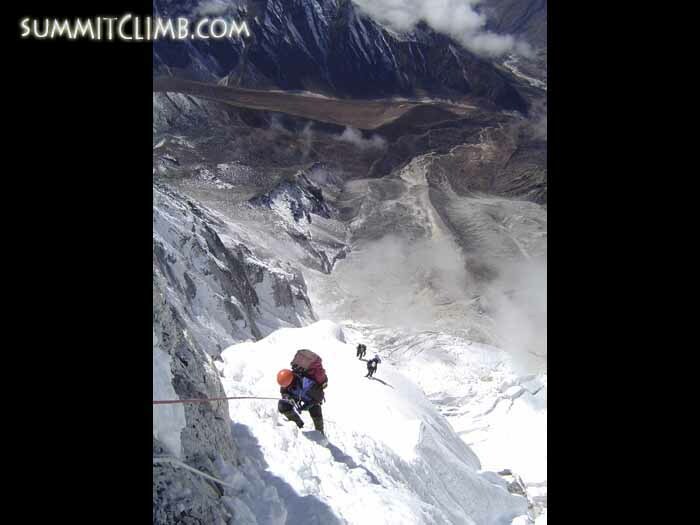 I was really impressed with the sherpas - Lakpa and Tenzing were great! Looking for the next mountain to climb!" "Strictly speaking, this was an "unguided" expedition. However, there was always some "guidance" prior to and during this fantastic expedition. 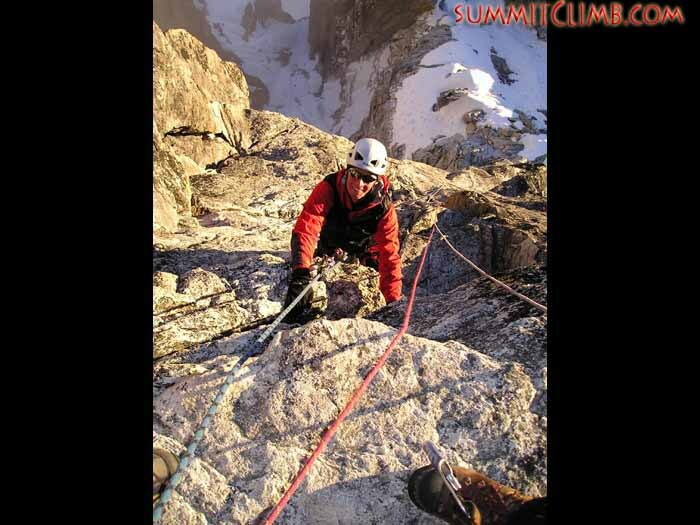 Before my trip, SummitClimb answered many questions that I had by email, clearly and in a timely fashion. 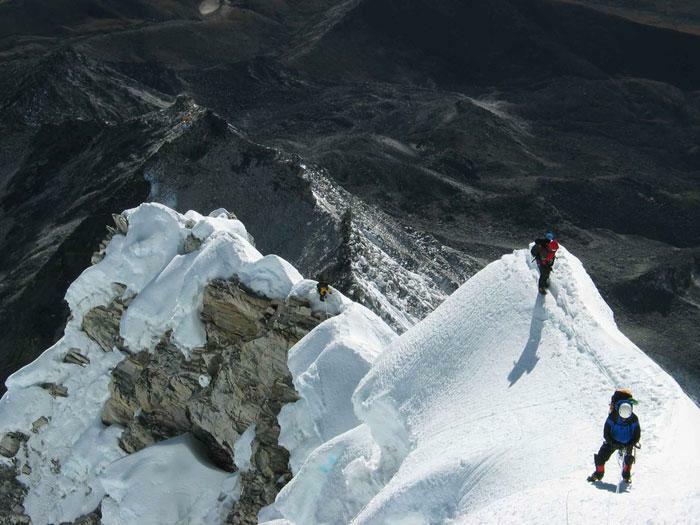 What's more, during the expedition, the leader and his excellent Staff, assistant leaders, and extremely competent Sherpas were always available to explain technique and offer assistance to ensure the best possible chance of success. 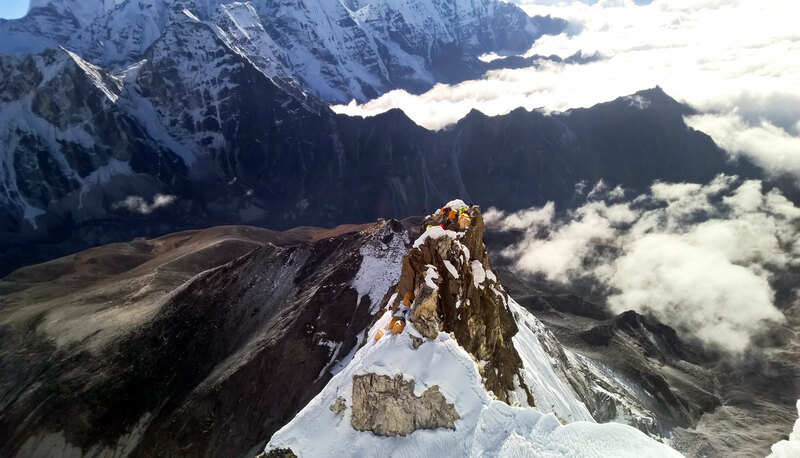 This does not imply that minor improvements can never be thought of for a very comprehensive, well-coordinated and well-established expedition with optimal flexibility, but everything detailed on the excellent website was accomplished and so nothing more could be expected. Thank you so much! - for your thoughtfulness right from the start, and for sharing your extensive experience with the entire group throughout."